Craving double ovens, yards of counter space and all the latest kitchen gadgets? Your dream kitchen may lose its mouthwatering appeal when you crunch the numbers. Extravagant new kitchens come with steep cost-per-square-foot price tags. Fortunately, designing a kitchen that won’t break the budget is simple. Easy to clean, super efficient and cost saving—small kitchens are all that and more. Take this advice for trimming the kitchen fat while still cooking up a functional, fabulous heart for your timber home. Start your small kitchen design with help from professional resources. Ask your architect, builder or timber company for names of kitchen designers. Check online for listings at the National Kitchen and Bath Association’s web site or talk to the staff at your local kitchen design center. Once you choose a pro to work with, be sure to involve that individual as early as possible in the design phase. A kitchen designer studies the function of this all-important room “to an infinitesimal degree,” says New Hampshire designer Ellen Winkler of Ellen’s Interiors. “The designer understands how a kitchen works.” Careful design helps you avoid mistakes that could result in a kitchen that’s uncomfortable, inefficient or not as durable as you’d like. Your designer must understand your kitchen lifestyle, Winkler says. Take note of who cooks or uses the kitchen in your family and when. How do you entertain? Are there children in your home or people with physical disabilities? Would you like an outside eating area in your new home? How often do you grocery shop? The designer should keep your answers to these questions in mind when laying out your new kitchen. Designers aren’t just for high-end projects. A good designer knows how to get the most bang for your kitchen buck, Winkler explains. For example, she’s designed a kitchen using just a handful of expensive hand-painted tiles set in a field of lower-cost stock tiles to make a big visual impact for less. Kitchen designers also bring knowledge of finishes, such as countertop materials, to a project. This in-depth information can help a small kitchen meet your needs perfectly. A built-in microwave space keeps counters open in a small kitchen and presents a streamlined look. Part of the beauty of a timber home is its ability to accommodate today’s open, casual lifestyle. Opening a small kitchen to other living areas will make it feel larger and give the cook the luxury of enjoying the home’s timbers. Architect Jeremy Bonin of New Hampshire’s Bonin Architects and Associates jokes about the “holy trinity: the view, the TV and the fireplace.” Most new-home buyers want to accommodate all three in their home design. People who would like to watch TV while in the kitchen often purchase a small set for that room, Bonin says. But you may want to create a design that opens the kitchen to the main views and provides a sight line to the fireplace. Not surprising, Bonin recommends placing the small kitchen near the dining area. “In a smaller house, there are usually fewer people eating,” he says. “The entertaining volume is smaller.” Opening the dining room to the kitchen adds versatility: A small table nearby can seat up to six, and planning for a breakfast bar or peninsula can add room for two or four more to eat. That bar, island or peninsula offers plenty more advantages, as well, Bonin says. “It helps divide the space to make it a lot more functional.” An island works wonders at keeping guests who want to hang out near the kitchen close by, but out from under the feet of the cook. It can serve as a buffet or beverage station and delineates the kitchen space from the rest of the living space. Making every corner of your kitchen work hard is a the goal of specialized cabinetry. Making the island extra deep allows for more storage space. “You can use 24-inch cabinets on the kitchen side and shallower cabinets on the other side,” Bonin explains. Those shallow cabinets that face the living area can be the perfect spot to stash items you use less often. With glass doors, those cabinets become displays for china or crystal—but don’t use glass doors on any island that’s also used for seating. Where the kitchen ends up in your general floor plan depends in part on your preferences. Many designs place the kitchen near an entry door or access to the garage, making it easier to bring in groceries. Is this the entry you’d like guests to use as well? It depends on your lifestyle. Bonin suggests setting aside space near a kitchen door for a coat closet that backs up to a shallow closet-style pantry on the other side, with access close to the kitchen. The closet spaces can help define an entryway of sorts, and provide all-important storage solutions for your small kitchen. One design challenge with small kitchens is balancing the desire for windows with the need for storage. When a client requests a wall of windows, “I start looking for a place to get storage outside the kitchen,” says Jim Driesch, design manager for Timberpeg. Pantries can solve the dilemma. Another option he suggests is planning for a kitchen with two exterior walls. You can then place a window on each of the outside walls, bringing light to the corner, cross ventilation and room for upper cabinetry. Shifting the sink toward those corner windows adds interest to the whole kitchen plan, Driesch says. Even in a small kitchen, Ellen Winkler takes pains to keep traffic moving. Don’t skimp on space around the island. An extra few inches can make all the difference. If you plan to eat outside your new home on a regular basis, be sure to create easy access to the home’s deck or patio from the kitchen. An island provides storage and workspace for the cook, while keeping guests out from underfoot. Task lighting helps fill in specific work areas. 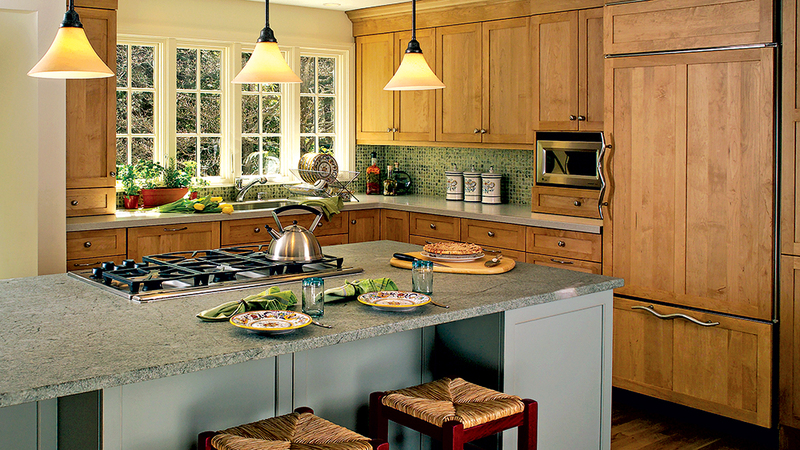 Cabinetry houses your kitchen essentials and makes a strong design statement, too. Most often, buyers specify cabinets that contrast with their homes’ timbers. Jeremy Bonin notes that the returning popularity of painted cabinetry brings intriguing choices. In a timber home with vaulted ceilings, Jeremy puts the vertical space to work by adding storage for infrequently used items above upper cabinets. You’ll need a step stool to reach these hiding spots, he says, but the extra space is worth the stretch in a small kitchen. Cabinets with glass doors can help reflect light in a small kitchen. Installing lights in those cabinets adds charm, too. Tread cautiously, though, Ellen Winkler says, when specifying glass-front units—and pay attention to what you’ll store in those cabinets. “You don’t want to see cereal boxes,” she cautions. The NKBA explains that small kitchens can appear larger when they’re outfitted with some open display shelves or cabinets, too. Whatever type of cabinets you choose, work closely with your cabinetry supplier. 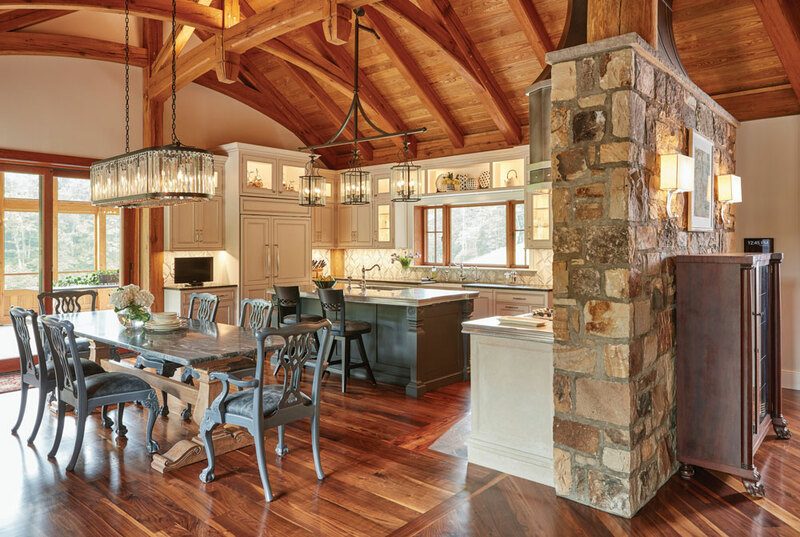 Jim Driesch notes that the location of timber posts, beams and diagonal braces in the kitchen must be taken into account when laying out cabinetry runs. 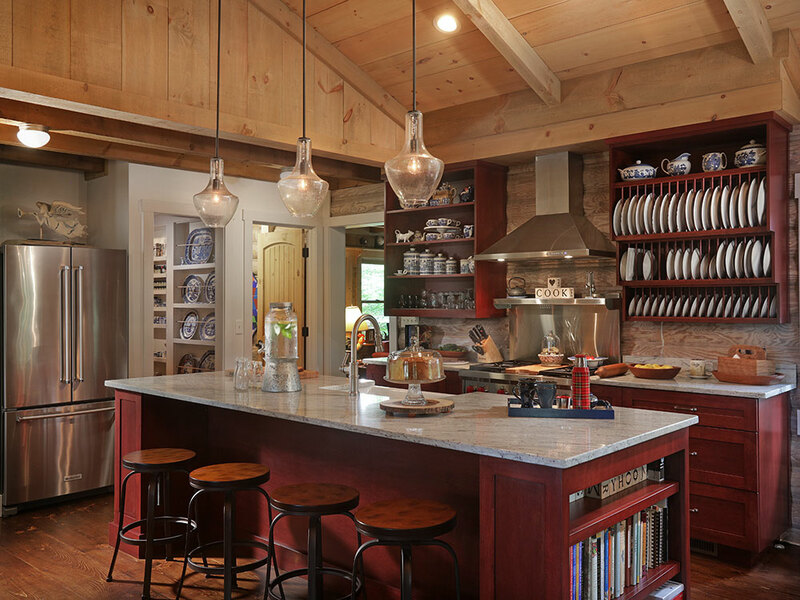 The timber framing doesn’t preclude you from using stock cabinets, he says—most of Timberpeg’s clients do. Remember, you can spice up even the most basic cabinets with eye-catching hardware, Ellen Winkler says. When selecting cabinets, take a good look at the storage solutions built in to today’s units. Dish drawers, spice racks and recycling centers are among the innovations. 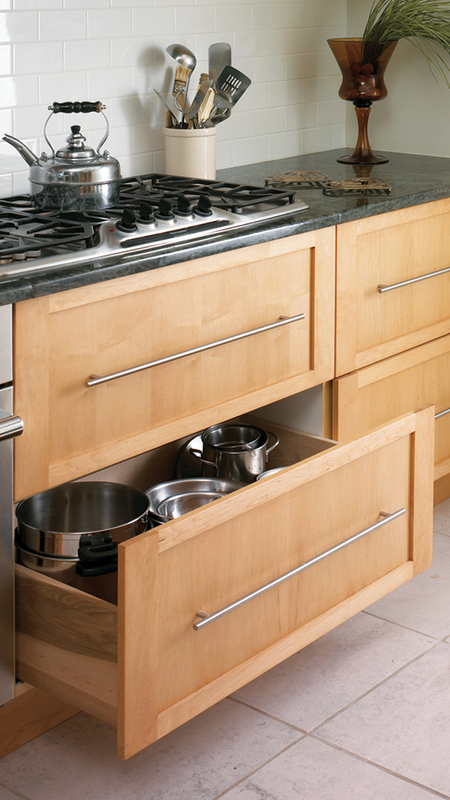 Winkler suggests using drawers instead of cabinets with doors. Searching for a particular pot or pan is easier if a drawer pulls out, she says. And, drawers outfitted with organizers for pot and pan lids make for even greater efficiency. A pull-out cutting board positioned near the disposal also saves critical counter space. Of course, a new smaller kitchen could give you the nudge you need to part with unused kitchen gadgets or equipment. 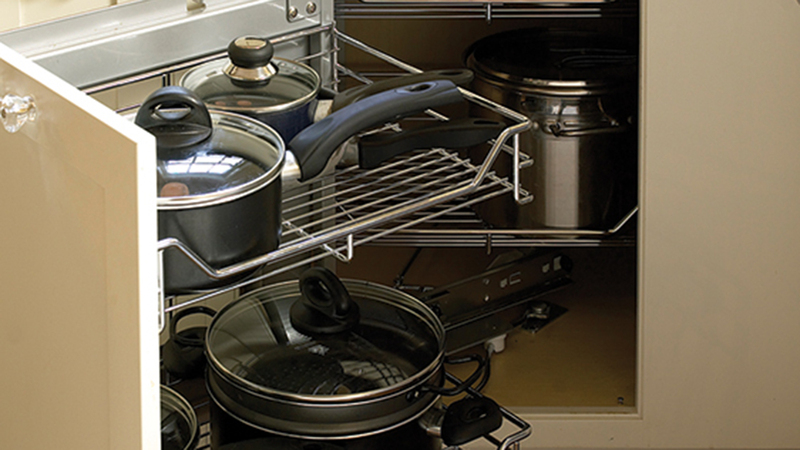 Deep drawers make it easier to find the pot or pan you need. Built-in dividers keep lids organized and easily accessible. Dish drawers are popular in today’s kitchens, too. Small kitchens benefit from compact or multifunction appliances. A super-sized refrigerator can dwarf a small kitchen. Refrigerator drawers are one solution to the giant refrigerator syndrome, Winkler says. Another is to choose a 30- to 36-inch wide model and specify French doors on top and a freezer drawer below. The French doors require less space to swing open than a single large door. Dishwasher drawers offer similar benefits for a small kitchen. 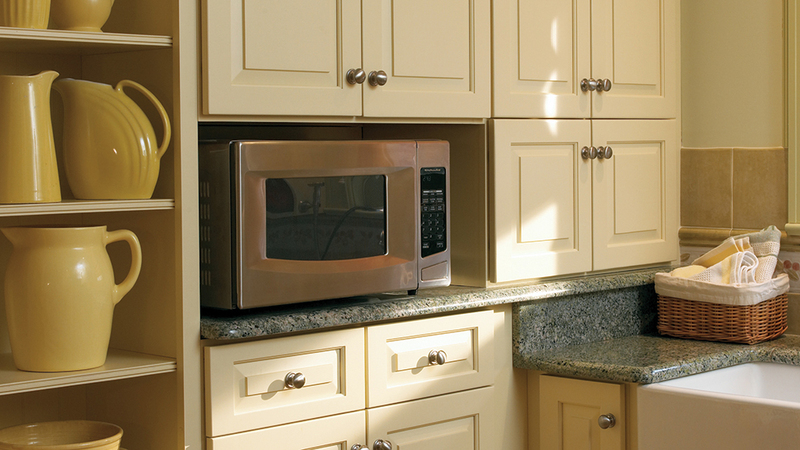 Build your microwave into your cabinets or island to conserve counter space, and look for a microwave that offers a variety of cooking functions. Keep in mind that placing a cooktop in an island requires a downdraft vent or a range hood. That range hood can block the open visual feel of the small kitchen, Bonin warns. Keep continuity in mind, Winkler suggests, when deciding on stainless steel appliances or appliances faced with cabinet panels. If your cabinet finish is dark, stainless appliances will create jarring visual breaks in the look of your kitchen. In that instance, camouflaging the appliances with panels maintains harmony. Aim for a monochromatic feel in your small kitchen, Winkler suggests, to help it feel larger. “You can use a countertop and cabinets in a similar color, then get a bit of contrast in the tile backsplash,” she says. In larger kitchens, you can mix countertop materials—wood for chopping, marble for baking and so on—but she recommends sticking with one material in a smaller kitchen. Should the flooring in your kitchen space be different from the other living areas? That, too, depends, says Bonin. “You could put tile in one area,” he says. Distinct flooring helps set the kitchen area apart, but changing flooring material may not make sense if the kitchen area is extremely small, he says. In all kitchens, big or small, good lighting is vital. Task lighting, overall lighting and accent lighting layer on top of each other to create a safe and welcoming kitchen. If your kitchen opens to other living spaces, remember to add a dimming feature to the kitchen lighting, Winkler advises. That way, when it’s time to serve dinner, you can lower the lights and forget the dishes in the sink for a while.